Hand #167: Rafi Amit Wins $1,000 Triple Draw Championship! Lenny Martin raises and Rafi Amit reraises. Martin calls. R1: Martin takes three and Amit is pat. Amit bets and Martin calls. R2: Martin takes two and Amit is pat. Amit bets and Martin is all in for 60,000. Amit calls. R3: Both are pat. Amit shows a 7-6-4-3-2 and Martin has an 8-7. 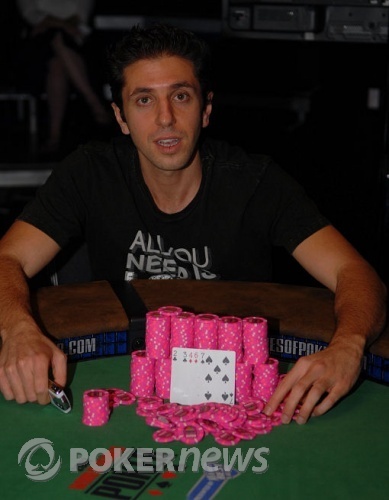 Rafi Amit wins $227,005, the Corum watch, and the WSOP bracelet -- the second for Amit after winning the $10K PLO in 2005. Lenny Martin takes $128,120 for second place, by far his biggest cash to date. Hand #163: Rafi Amit gets a walk. Hand #164: Amit raises and takes it. Hand #165: Rafi Amit gets a walk. Hand #166: Amit raises and takes it. R1: Amit takes one. Martin takes two. Amit bets in the dark. Martin calls. R2: Each take one. Amit bets and Martin folds. Martin now has 270,000. Hand #162: Martin gets a walk. Hand #156: Rafi Amit raises and takes it. Hand #157: Amit gets a walk. Hand #158: Lenny Martin gets a walk. Hand #159: Martin raises and takes it. Hand #160: Amit raises and Martin calls. R1: Amit takes three. Martin takes two. Both check. R2: Each take two. Martin checks. Amit bets. Martin folds. Martin is down to 450,000. Hand #154: Rafi Amit gets a walk. Amit raises and Lenny Martin calls. R1: Martin takes two. Amit takes three. Martin bets and Amit calls. R2: Each take two. Martin bets and Amit calls. R3: Martin is pat and Amit takes one. Martin bets and Amit calls. Martin shows 8-7-5-3-2 and nearly doubles up tp 585,000 -- he couldn't quite get all in. Amit has 935,000. Rafi Amit raises and Lenny Martin calls. R1: Each take two. Martin checks. Amit bets. Martin folds. Martin now has 335,000 and Amit has 1,185,000. Hand #151: Rafi Amit raises and Lenny Martin folds. Hand #152: Amit gets a walk. Hand #145: Rafi Amit raises and Lenny Martin folds. Hand #146: Amit gets a walk. Hand #147: Amit raises and Martin folds. Hand #148: Martin raises and Amit folds. Hand #149: Martin gets a walk. Hand #150: Martin raises and Amit folds. Lenny Martin raises and Rafi Amit calls. R1: Amit takes two. Martin takes three. Amit bets in the dark. Martin raises. Amit calls. R2: Each take one. Amit bets. Martin is all in for 70,000. Amit calls. R3: Amit is pat. Martin takes one. Martin shows 8-7-6-4-2 to Amir's 9-7-6-5-3 and Martin doubles to 495,000. Amit's lead is now only 2 to 1.